Brad Fox is a Senior Associate at NAI Capital’s office in Ontario, California. Brad is a leading specialist in the Inland Empire Industrial real estate market, and he has great market knowledge and understanding of the economics that drive commercial real estate. Mr. Fox provides the following services which include: buyer and tenant representation, owner/landlord representation, acquisitions and dispositions, online marketing, and detailed market analysis. 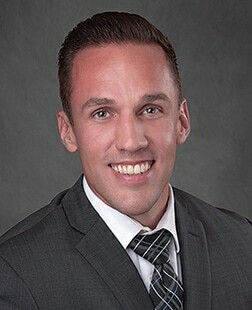 Brad: I specialize in selling and leasing industrial and land properties in the Southern California market. To keep my schedule as efficient as possible, I like to dedicate Monday’s and Friday’s to working in the office, and Tuesday through Thursday I spend my time touring properties, meeting with clients, canvasing, and cold calling. Brad: I started using ClientLook over a year ago and it has been amazing. Nothing but positive things to say about my experience! Brad: Prior to ClientLook I used ACT and then I used Apto. Both of those systems were too complicated, and I want something that was easy of use. With Apto, their user interface isn’t functional and it doesn’t work with my business model. Brad: Getting my data imported into ClientLook was very easy! The Virtual Assistant helped me get everything set up, and within 24 hours everything was up and running smoothly. Brad: ClientLook’s user interface was exactly what I was looking for. There is so much you can do within the system, yet it is simple to use. Plus, the Virtual Assistant and the integrations were a huge plus for me since these are extremely valuable. Brad: ClientLook has helped with keeping track of my deals, leads and prospects and saves me a lot of time. With the time saved, I can focus more on each transaction since all of the information I need is all in one place. Since using ClientLook, I no longer have to search for emails and call updates since I can access them instantly. Plus, the Virtual Assistant has given me more freedom with my time as well since I no longer have to deal with all of the data entry. Brad: The Virtual Assistant is one of my favorite features since it saves me so much time! The VA handles all of my data entry so I can focus on my clients and doing deals. Currently, I utilize the VA services about twice per week. I also like the ability to track activities and updates and that I can link everything together. Whenever I send a client or deal related email, I BCC a copy to my ClientLook email address so everything that is related to the transaction stays together in one place. The iPhone app has also been a great feature. I use it daily when I’m out in the field so I can instantly record an update about the property tour, client meeting, or call. The integrations are also a bonus; I personally like the MailChimp and NAR integrations the most and use them quite often. Lastly, the ability to add custom fields has been very helpful in keeping everything organized all in one place. Brad: Sign up with ClientLook! Seriously! Remember that the best CRM is the one that you will use, so subscribe to a CRM that is easy to use, fully functional, and is 100% commercial real estate focused. ClientLook is backed by some of the best people in the industry and was created specifically for commercial real estate professionals. If this is your industry, choosing ClientLook is a must. Brad: My experience with the ClientLook team has been outstanding! Everyone is very responsive and all of my questions are answered quickly. I speak with Michael Griffin and John Dawson on a regular basis, and they both value my opinion and I can tell that they appreciate the users.